Looking to renew your membership to our CSA? Click here for details! Chickadee Creek Farm is a certified organic vegetable, flower and herb farm. The farm was started by Jess Niederer in 2010 and is located on part of our family farm. Four generations of our family have farmed in Hopewell Valley, NJ, and the previous generation preserved the land so that it can never be developed. The 80 acre farm is on Titus Mill Road in Pennington, NJ. Our crew of 9 farmers grow on 20 of those acres, with 14 of them devoted to vegetables, 2 to small fruits, and 3 to oats. The goal of Chickadee Creek is three-pronged; make a sustainable living off of the family farm, supply our community with healthy and flavorful food, and do all of this as efficiently as possible to keep costs down and to keep life enjoyable for farmers and for our customers. We grow over 50 types of vegetables chosen for flavor and suitability to our climate, running the range from zucchini, striped heirloom tomatoes, amazing potatoes, and ridiculously sweet winter carrots to lettuces, delicious ginger, and the prettiest flowers. “Transitional organic” means that some of our farmland is in the midst of the mandated three-year process of becoming certified organic. Jess’s family grew wheat, soybeans, and hay on this farm. In 2010, when Jess began her own business growing vegetables, she immediately began using organic practices. All of our practices and farmland are inspected by and follow the rules of the National Organic Program. 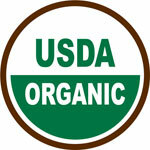 In July of 2012 organic certification began for the first five acres. As we take over the family land bit by bit, the new ground is called “transitional organic” until the mandatory three year waiting period is over. As of June 1st of 2017, 20 acres are fully certified organic! We have now added work-shares to our Farm Membership options!